Joel Spivak loves a good hot dog. Who doesn’t? Vegans and vegetarians, perhaps. But Spivak, a resident of the 600 block of Carpenter Street, has taken his love for hot dogs to an impressive level. July is officially National Hot Dog Month, and he has a slew of programming that’s inspired by hot dogs and gives back to the city in a variety of ways. Even Mayor Jim Kenney’s in on it. Kenney signed a citation on July 1 that declares Philadelphia home to a month-long celebration of the handheld backyard barbecue staple. Spivak’s had them all. He and his father, a traveling car parts salesman before WWII, took his son around the city selling and collecting installation payments (a quarter down, a nickel upon subsequent visits). He remembers luncheonettes on every corner where cheesesteaks, hot dogs, hoagies, and cheeseburgers were staple lunches. “If we were on the east side of town we’d go to Pat’s [King of Steaks, 1237 E. Passyunk Ave.] or Nick’s Roast Beef [2149 S. 20th St.] or A.P.J. Texas Weiner on N. 13th St. near the Convention Center,” he remembered fondly, and reminded that Texas Weiners, 1426 Snyder Ave., rivals A.P.J. for oldest in the city. But how does the expert like his dogs? Spivaks’ National Hot Dog Month calendar is full. He’s already established a window exhibit with the History of Hot Dogs at 703 S. Fourth St. Just this week, he visited the Veterans Multi-Service Center in Old City and fed nearly 600 vets with donated dogs. On the 19th, he’ll visit a summer camp at Hero Community Center at 17th and Tioga streets to provide a free lunch. At Lucky’s Last Chance in Manayunk, he’s convinced overseers to donate $1 for every dog sold to PAWS. 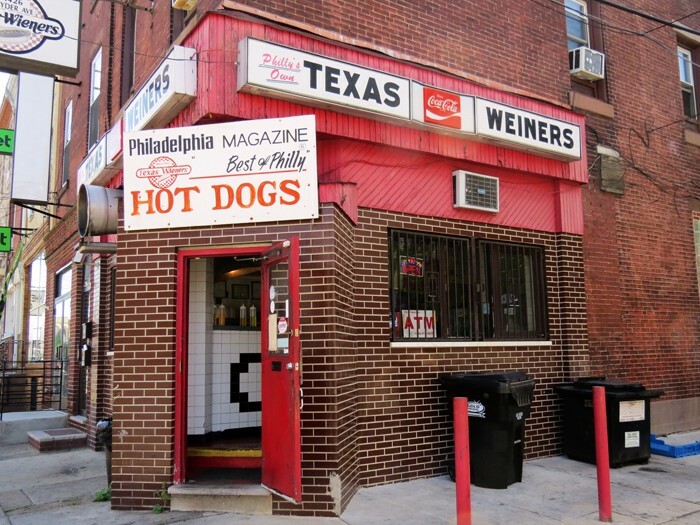 On the 22nd, he’s organizing a 2 p.m. visit to “Philadelphia’s oldest hot dog stand,” Texas Weiners. He’s also going to Queen Village to provide lunches at the Philips Temple Christian Methodist Church’s, 754 S. Third St., bible camp. But the kicker is a Pat’s alliance — between July 22 and 29, if you donate blood at the American Red Cross at Seventh and Spring Garden streets, you get a free hot dog at Pat’s Steaks, originally a hot dog stand. South Philly artist Hawk Krall, a resident of the 1000 block of Tree Street, could challenge Spivak for resident hot dog expert in part because of a month-long tour of America that included around-the-clock dog consumption. His favorite Philly dog is in South Philly. South Philly residents have likely seen Krall’s food illustrations and not known it. The line cook-turned-artist has a monthly illustrated column with Saveur magazine, including a recent thorough investigation of New Jersey’s hot dog catalogue. For three years, he illustrated a hot dog of the week for Eater, and that got him in touch with the late, great Hot Diggity, a hot dog destination that used to thrive at 630 South St. If you ever ate a dog at Hot Diggity, you witnessed his menu drawings of all the beautiful variations — Chicago dogs, Texas dogs, Detroit dogs, you name it. He also recommends RJ’s Hot Dog Stand in Essington, two miles west of the Philadelphia International Airport. Spivak prefers his dogs assembled before his eyes, which is a luxury at Citizens Bank Park, 1 Citizens Bank Way. He misses catching games in Trenton, N.J. but fondly remembers dogs at Veterans Stadium. He helped design and build places like Lickety Split, formerly at 401 S. Fourth St. and Black Banana, which used to be at 534 South St. He remembers when food carts were pushed off the street and inside for sanitary reasons, but he’s preparing a one-off Pop-Up Exhibit at 2 p.m. July 15 at Fifth and South streets where descendants of hot dog heroes will tell stories about their parents and grandparents.